After being located in downtown Charleston for 83 years, Bishop England High School moved to Daniel Island seven years ago to meet the demands of growing enrollment. Today the school is the largest four-year private Catholic high school in South Carolina. Although the names, faces and locales have changed over the years, one thing about the school hasremained constant: its mission to “promote the spiritual, intellectual, and physical growth of the individual” through the combined support of families, faculty members and administrators. Bishop England has a rich history dating back to Sept. 22, 1915, when it opened as Catholic High School, a department of the Cathedral School on Queen Street in downtown Charleston. The Rev. 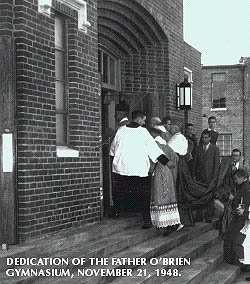 Joseph L. O’Brien organized the new school with the cooperation of the Rev. James J. May. At that time, the school enrolled 67 students. The school moved to Calhoun Street in 1916 and was officially named Bishop England High School in honor of John England, the first bishop of the Diocese of Charleston. In September 1995, Bishop David B. Thompson of the Diocese of Charleston announced the decision to move the school from Calhoun Street to Daniel Island. At that time, the school was the largest private high school in the state, serving 805 students. The administration had been doing its best to keep pace with the school’s rapid growth. It had added four modular units (eight rooms) providing four classrooms, a conference room and a chapel for Mass in 1993. However, with limited room to expand downtown, the decision was made to move east of the Cooper. The College of Charleston purchased the Bishop England property. The Daniel Island Development Co., partially owned by the Harry Frank Guggenheim Foundation, donated 40 acres of land on the island for the new school. Construction began in 1996. To help meet the high cost of the building project, Bishop England established a campus campaign in January 1997 with a fund-raising goal of $2.5 million. In the summer of 1998, with the aid of students, faculty and volunteers, the school moved to its spacious new home. Classes began that fall. Bishop England High School is located just outside of the Daniel Island Town Center on Seven Farms Drive. The campus features a main building, a gymnasium, a library, a chapel and three athletic fields. The “Battling Bishops” are known statewide not only for excellence in the classroom, but for outstanding performances on the playing field as well. The girls’ soccer team has won 11 state titles — including four straight — and the girls’ tennis team has won 13 state champions since 1983. The girls’ volleyball team captured its 15th title in October — the fifth consecutive. The boys’ soccer team has garnered nine state titles; boys’ tennis, eight; and boys’ baseball, three, most recently in 2003. More information on Bishop England High School is available at the school’s website, www.behs.com.